All The Writers You Love Probably Love Dorothy Dunnett Author Alaya Dawn Johnson describes the late historical novelist as the literary equivalent of the Velvet Underground: "Not many people bought the books, but everyone who did wrote a novel." The old fiction room at my high school was a small box of wonders, and no matter how long I spent investigating its seven and a half overstuffed shelves, I never stopped discovering treasures. When I was sixteen, the shelf which held authors A through D divulged a small, yellowing paperback with a splashily romantic cover: a long-limbed blond man in Renaissance dress, gripping both a woman and a rapier. 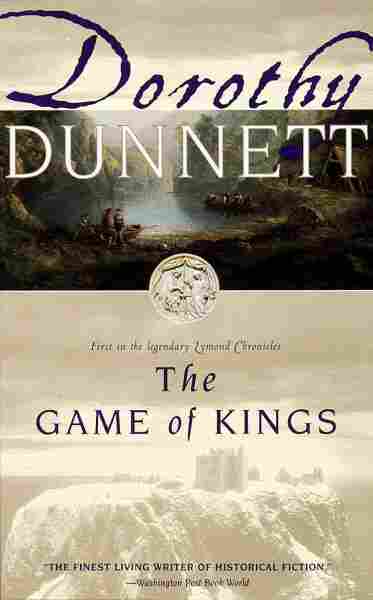 The title was The Game of Kings, its author was Dorothy Dunnett, and reading it was going to change my life. Years later, I would discover how many other writers, across varied genres, shared this foundational influence. I've come to think of Dunnett as the literary equivalent of the Velvet Underground: Not many people bought the books, but everyone who did wrote a novel. The Lymond Chronicles follow the minor Scottish nobleman Francis Crawford of Lymond, a dark star whose gravitational charisma pulls in everyone around him: friends, lovers, enemies (and some who are all three at one time). We see him through a kaleidoscope of viewpoints over the course of the six dense, continent- and decade-spanning novels. The hours I spent attempting to decipher some of Dunnett's more oblique passages opened me to the possibilities of romantic storytelling (in the capital-R literary movement sense as well as the good old-fashioned true love sense). At one point, Lymond's friend Jerott, incandescent with rage, hurls the word "catamite" at him. I looked this up in the dictionary, but its dry Biblical referent didn't quite explain Jerott's fury or disgust. So I asked my English teacher, who read the passage, gave me a measuring look, and declared with a reasonably straight face that he didn't understand it either. Years later, after I figured out what precisely Lymond had done (and who he had done it with), I met the author Ellen Kushner. I had just finished her novel The Privilege of the Sword. This is a brilliant work in its own right, but what made me screw up my courage to approach her one night was this intuition that had come to me in the middle of a beautiful series of scenes about her iconic gay lovers: that she had read Lymond, and she loved it. "Ever since I first read them in college, as a writer I've been in dialogue with the Lymond books," Kushner says. They captured her imagination from the beginning: "As I read, I kept trying to figure out, 'How did she just do that?' I learned a lot." Joanna Bourne, whose French Revolution spy romances are some of the best historicals being published right now in any genre, agrees: "Dunnett is such a magnificent writer. I could open one of her books at any random page and I'd come away learning something about the craft of writing. If a writer wants to depict political intrigue and misdirection — well, Lymond is the template of hidden agendas and the benchmark of single-minded ruthlessness." Many writers emphasize how much Dunnett has taught them about craft. Adult fantasy novelist Max Gladstone jokes, "Dunnett probably made me insufferable for a year or two, but she helped me find my voice." And Kushner has taken to calling the novels "the Dorothy Dunnett Six-Book Writers' Academy." One of my own literary heroes is Guy Gavriel Kay, author of Tigana and The Lions of Al-Rassan. When I caught up to him at this year's World Fantasy Convention (he was the Guest of Honor), he told me that what he most took away from Dunnett's novels was a freedom to make his characters intelligent. To sometimes have the characters a few steps ahead of the reader (even ones who already know what a catamite is). ...this unites all of us varied writers who have crossed the Lymond Chronicles event horizon: whatever we write, we want to do it just as well, and passionately. As I came to realize that the world of people who Knew About Lymond included a whole host literary idols, I felt at once ecstatic and curious. What was it about these melodramatic, dense, swashbuckling historical novels that had so held the attention of so many writers in so many genres? I began to feel that her greatest impact came in areas we often dismiss as pulp — maybe because writers in those genres are better able to understand the genius of her occasionally melodramatic excesses. Science fiction giant Kim Stanley Robinson first read the Lymond novels when he was a teenager, and identified particularly with Dunnett's style: "[Her] writing was lush and her sensibility romantic." "They're the kind of books that are truly reckless with your emotions," says bestselling young adult fantasy author Cassandra Clare. Dunnett, she adds, crafts characters who are dense and ultimately lovable, and then uses that reader investment as a blade: "Every time you think she can't hurt them — and you — more, she does it again. It really taught me that finely wrought emotional pain can be an exquisite joy for readers, even if they claim it hurts!" Not everyone swoons for Lymond: Justine Larbalestier, an acclaimed multi-genre young adult writer for whom Dunnett's work has been an undeniable influence, has a somewhat contrarian view. "I do love those books," she says, "even though they drive me crazy. They fall apart into ridiculous melodrama. And I say that as a fan of melodrama." But then, what I particularly love about Dunnett is how she earns her excesses. She leads us to the final act with such skill and intelligence that I'm entirely invested in scenarios that would make me roll my eyes in a lesser novel, with lesser characters. The morning after I finished the last volume, Checkmate, in an all-hours binge reading session, I found myself crying, desolate. After four years of reading these books, drawing out that exquisite excess, I would never again read a new word of Lymond. Part of me wanted to read it again. Part of me wanted to figure out how to be Lymond (or at least fall in love with him). But mostly I ached because I knew that however I did it, I needed to be a writer who would evoke that kind of emotional response in my own readers. Dunnett had taken away my complacency. And I propose that this unites all of us varied writers who have crossed the Lymond Chronicles event horizon: whatever we write, we want to do it just as well, and passionately.